4 carbs per 2 tbsp serving. Perfect for chicken or pork ribs! The avocado makes these velvety smooth! Only 4.5 net carbs per brownie! This makes a BIG BATCH! 2 1/2 kilograms of chicken. r approximately 24 drumsticks. Preheat oven to 350 degrees. Line 12 muffin tins with paper or foil liners. In a small saucepan, over medium heat add molasses, steviva and butter. Allow butter to melt and steviva to dissolve completely stirring occasionally (about 5 minutes). Combine all muffin ingredients in a medium sized bowl. Mix well. Don’t worry about over mixing. Can even use a blender to mix ingredients, but add diced apple after using the blender. 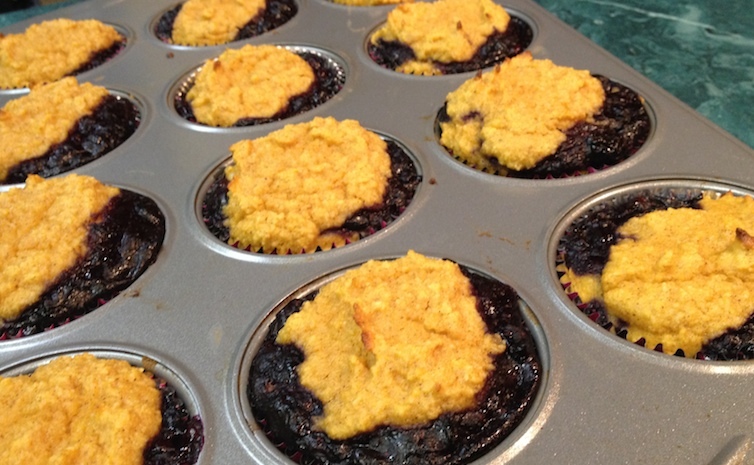 Spoon into prepared muffin cups. Bake for 20 minutes. 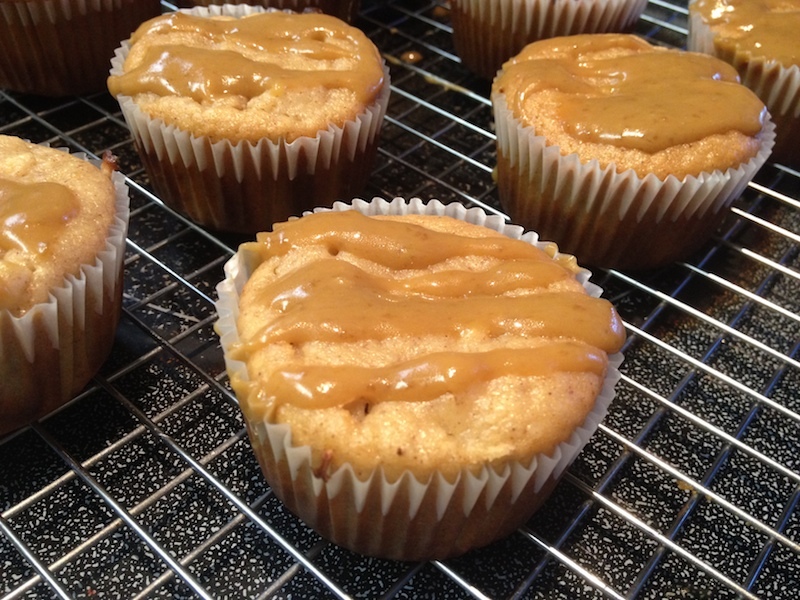 Drizzle caramel topping over top. Allow to cool or enjoy warm. Combine blueberries and 2 tbsp steviva blend in a small saucepan and cook on medium-high heat. You may want to slightly mash the blueberries a bit with a potato masher. Add Thick-It-Up. Turn heat down to a simmer. Combine all muffin ingredients in a medium sized bowl. Mix well. Don’t worry about over mixing. Place a small spoonful of batter in each muffin cup. Just enough to cover the bottom. Divide jam over the 12 muffin cups. Dollop the remaining batter over the muffins. * molasses and steviva blend is used in place of brown sugar sweetener equal to about 2/3 of a cup. **there is a stevia sweetened dark chocolate available at the Bulk Barn. Coarsely chop it up for NSA chips without using artificial sweeteners. Preheat oven to 350 degrees. Lightly grease a 9×13″ pan. In a medium bowl, combine all Brownie ingredients and mix well. Spread into pan. bake for 20-25 minutes. 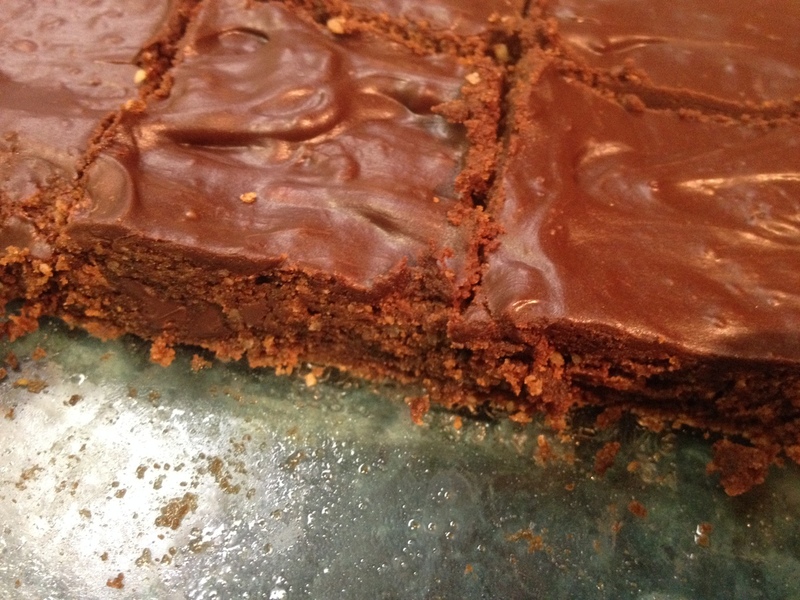 Brownies may seem jiggly but will set upon cooling. For topping, melt chocolate in a microwave safe dish. Try 20 – 30 seconds at first. When melted, stir in cream and smooth over cooled brownies.